Noted first by New York Magazine yesterday afternoon, the New York Times finally took steps to close down an extremely simple workaround to the newspaper’s online paywall. One day after the paywall went live during March 2011, tech savvy users discovered that eliminating the “?gwh=numbers” phrase from the URL allowed anyone to continue reading beyond the allotted twenty free articles per month. After deleting that section of text, the user could simply reload the page and the payment call-to-action overlay would completely disappear from the page. 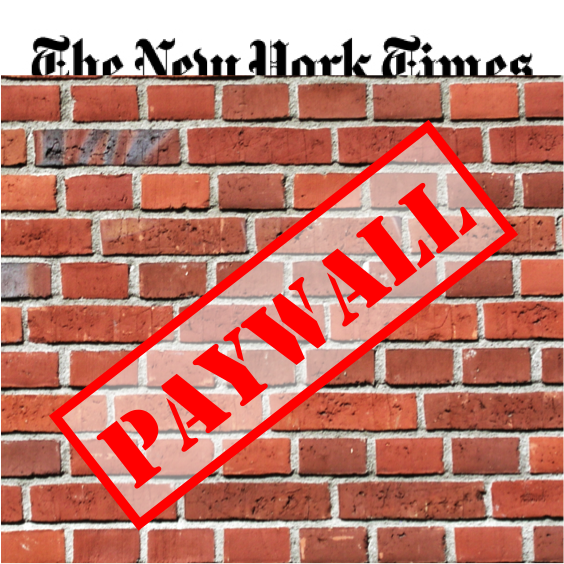 Unfortunately for the New York Times, there are still plenty of ways to avoid the online paywall and continue to read articles for free. For instance, users can simply search for the article through Google search or a social media network like Twitter or Facebook. Article links that are clicked from a Google search results page or a tweet do not count toward the monthly limit that now stands at ten articles. The Google search method also works for the Wall Street Journal paywall. In addition, users can use a private browsing window such as Google Chrome’s Incognito mode or Firefox’s Private Browsing mode. The cookies are deleted each time the window is closed, thus the New York Times can’t keep track of the number of articles that have been read during the month. The user could also clear the browser cache to reset the 10-article limit, but that method will erase all saved settings for sites other than the New York Times. 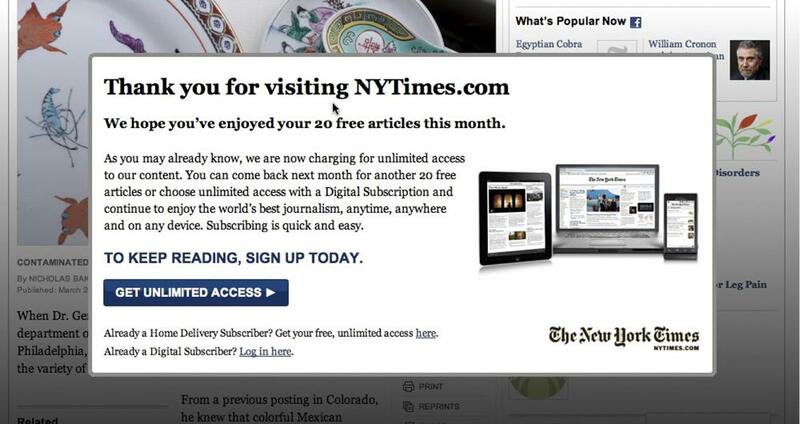 Finally, the NYClean bookmarklet can strip the payment call-to-action overlay from a New York Times article. Rather than altering the URL or the cookies, the bookmarklet basically disables code that displays the overlay window. The developer that created that workaround also created similar bookmarklets for the L.A. Times paywall as well as the Globe and Mail paywall. Hypothetically, a tech savvy user could accomplish the same method by inspecting the overlay element on the page within Google Chrome and hiding it from view using the browser’s element panel. 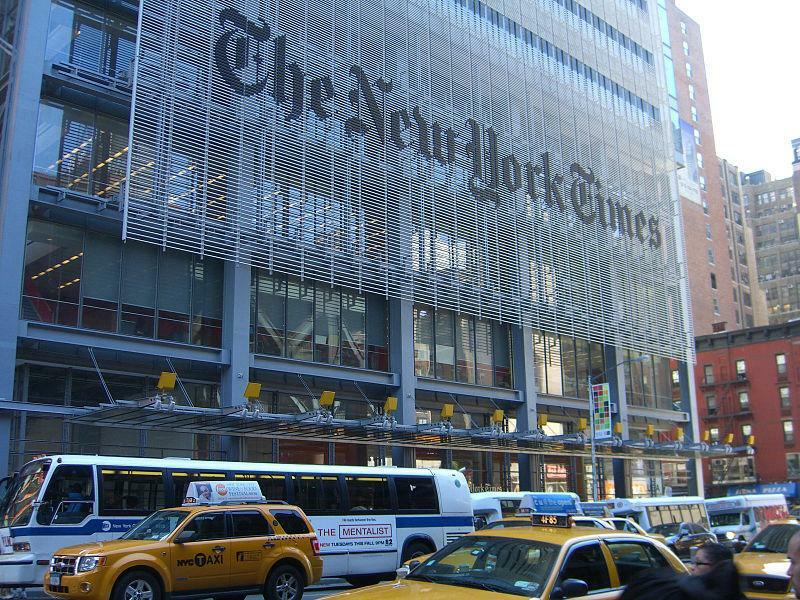 While the New York Times has approximately 640,000 paying users at this point, it’s possible that the news organization could attempt to close more loopholes in order to spur increased growth. Compared to the subscriber number from the previous quarter, the total number of paying users has grown by about thirteen percent. At the base rate of $15-per-month for access to the New York Times on the Web and smartphones, this means the organization is pulling in a minimum of 115 million in revenue from digital subscribers. However, it’s likely that New York Times management wants to increase that figure dramatically to offset the decrease in readership of the print edition.